A Winimac Middle School student died in a crash on U.S. 31. 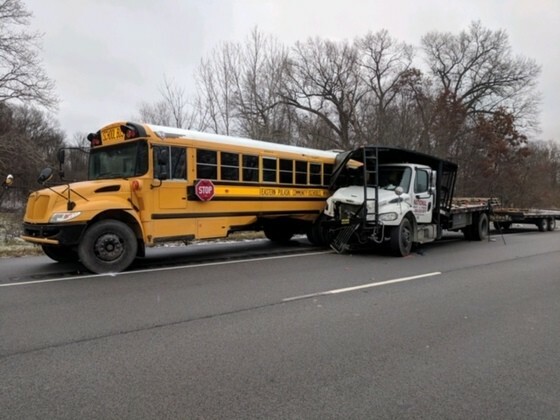 The collision happened just after 9 a.m. on Wednesday, Dec. 5, just north of Argos, when the Eastern Pulaski Community School bus was struck from behind by a truck. The school bus, which was drive by a 54-year-old woman of Winamac, had just stopped, as required by law, at the railroad crossing just south of Michigan Road. As the bus began to accelerate it was struck from behind in the left rear by a 2016 Freightliner straight truck driven by a 26-year-old Camby man. Owen Abbott, 13, was seated in the left rear of the bus was pronounced dead at the scene. The coroner’s report lists his cause of death as “multiple blunt force trauma.” An official autopsy is scheduled for Thursday. Another student, 14, was airlifted from the scene and taken to Memorial Hospital in South Bend. That student’s injuries were believed to be non-life-threatening. Other students were taken to Saint Joseph Regional Medical Center in Plymouth for complaints of pain and reunification with parents. At the time of the crash the bus was occupied by 38 eighth grade students and three chaperones that were on the way to see a Christmas musical at the Wagon Wheel Theatre in Warsaw. Toxicology results are pending for both drivers, which is required by law for vehicle operators involved in serious injury or fatal crashes. Weather is not believed to have been a factor at the time of the crash. I have stopped busses at this crossing many times, and have always been afraid of being rear ended. Buses and trucks displaying hazardous materials placards are required to stop at RR crossings. About 10 years ago a truck hauling propane was rear ended by another truck at the same RR crossing. This law creates more hazzard then it prevents and needs to be repealed. The penalty for not stopping is very severe. The driver could loose their CDL.